I use this technique in almost everything like effects, dialogue, music and in my master chain. When I found out that some great music mastering engineers using this technique I decided to see if I could adapt it for audio post. What I do to get a low end tight is to use a Pultec EQ, the Pultec EQP-1A is an EQ, where in both the original hardware and the various plug-in emulations, you apply simultaneously both boost and attenuation of the same low frequencies. 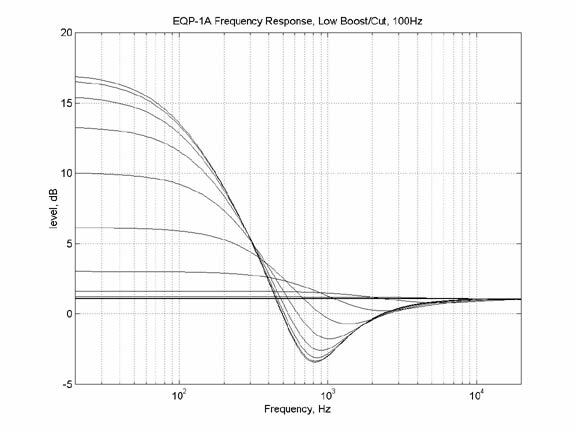 You might expect that they would cancel each other, but the boost curve is slightly different than the attenuate curve and at the most extreme settings results in a dip at around 800Hz. The variety of shapes available at more moderate settings and of course the possibility of different amounts of cut and boost and the 4 available frequencies show how such a variety of results can be gleaned from just three controls. The low-end becomes bigger without becoming muddy and can add clarity for the low end too. You can learn more about the Pultec EQ in our A-Z Of UAD - P Is For Pultec and also Russ has this tutorial showing how to use the Pultec EQ trick in music mixes.